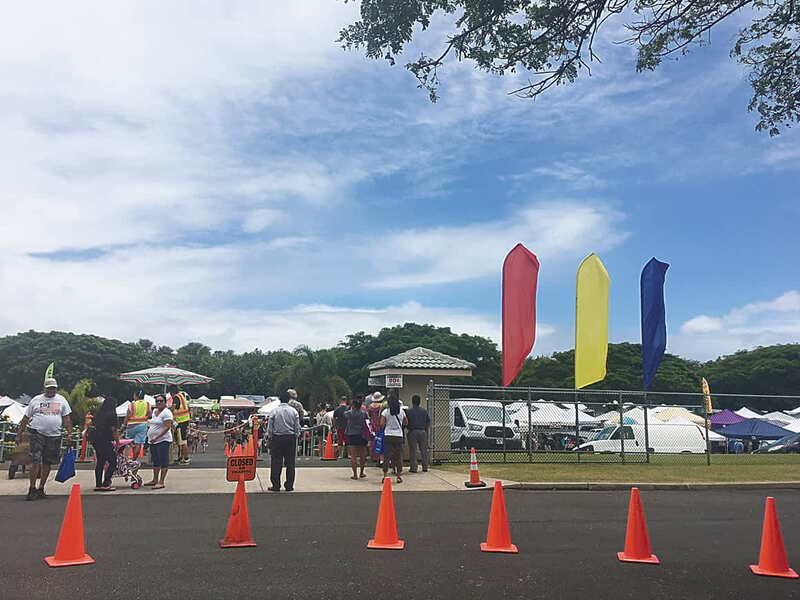 The entrance of the Maui Swap Meet greets you with three vertical banners, the same general colors as the Philippine National Flag. 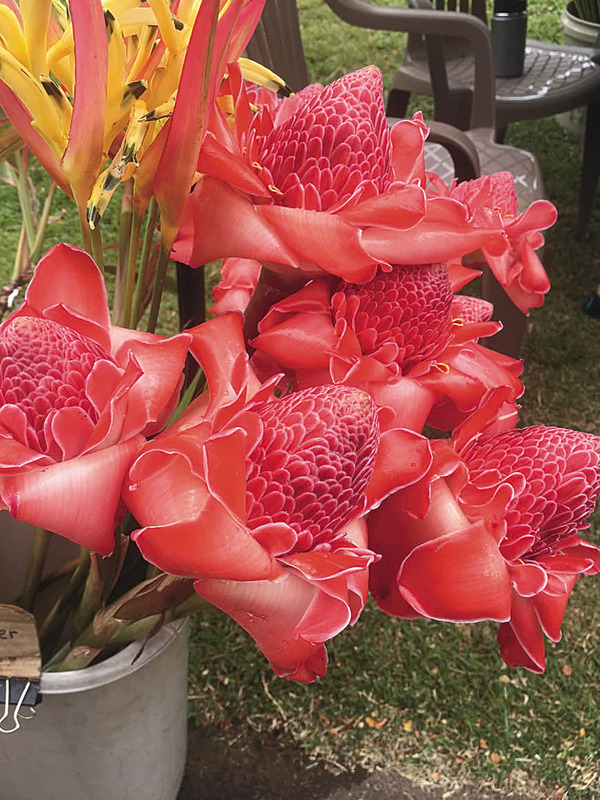 Where on Maui can you find great bargains, clothing and accessories, fruits and vegetables, tropical blooms, jewelries, beauty and bath products, decor, arts and crafts, local food, ‘ukulele, massage services, all in one place? If your answer is Maui Swap Meet—you are correct! 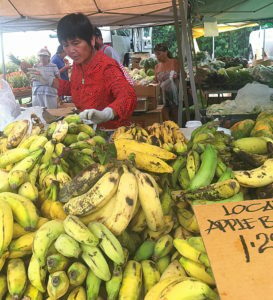 The Maui Swap Meet has been an institution loved by both local residents and tourists since 1981. 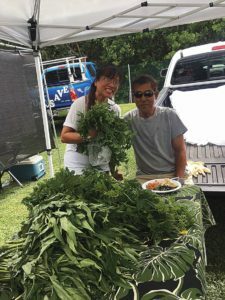 It is held every Saturday morning from 7 a.m. to 1 p.m. in the parking lot of University of Hawai‘i Maui College, just off Kahului Beach Road, across Wahinepio Road from the Maui Arts and Cultural Center. The entrance fee is also 50¢ and there is ample parking. There are about 200 vendors and thousands of visitors (locals and tourists) come every week. I was one of those thousand visitors last week. 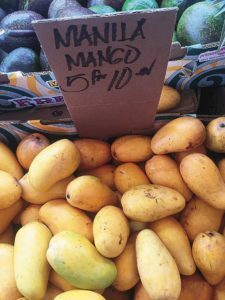 Upon deciding to talk story about the Maui Swap Meet here on Kwento-Kuwentuhan, I went to the Swap Meet not only to shop but also to “talk story” with some of the Filipino vendors there. So where do we find the Filipino vendors at the Swap Meet? They mostly are the vendors of fresh fruit and vegetables. For example, at stall 617 I met Fredelita Corpuz and at stall 615 I met Evangeline Traje. Both of these stalls are filled with fresh produce. I got excited when I saw that they have Manila mangoes and guyabano (soursop). Those fruits were among my favorites as I was growing up in the Philippines. And of course there were green leafy vegetables such as malunggay and bitter melon leaves. 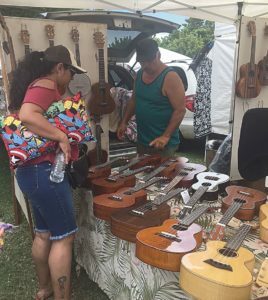 We didn’t get a chance to talk story because they were very busy but the next time you go to Maui Swap Meet, make sure to stop by their stalls. You won’t be disappointed with the variety of choices. Aside from fruit vendors, I saw my friend Mike Dougherty at the swap meet. Mike is hapa. His mom is from the Philippines. Mike is an artist. He is a talented musician and he also makes beautiful jewelry. At the Maui Swap Meet he sells ‘ukulele as well as his jewelry creations. And if you stop by at the right time, you might even get free entertainment as Mike plays his ‘ukulele and sings there too. You can also find Mike in his Lahaina store named Kula Gold. I continued my journey and visited some of the clothing and accessory stalls. 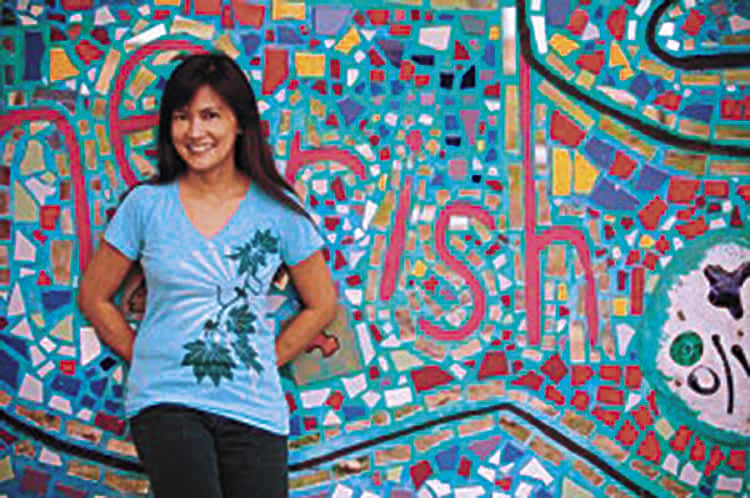 I met Christina Corpus at stall 169 and she sells Hawaiian dresses and shirts. Variety of styles, mostly with plumeria and tropical prints which are very popular among tourists. The t-shirts she has for little kids are so adorable you’d sure want to buy one for your anak, apo or pamangkin. The weather is usually humid, sunny and hot so make sure to put sun screen on and bring drinking water. Or you can buy buko (fresh coconut) being sold there at the swap meet. Speaking of sun screen, check out the Nalu Koa stall by Charles and Stephanie Gray. They sell organic Reef Safe Sunscreens and After Sun Kool Ocean Gel. These gels are very soothing and help heal sunburns. Charles is what we fondly call “Chop Suey” here in Hawai‘i. That means he is of mixed ethnicity—Hawaiian and Filipino are part of the mix. 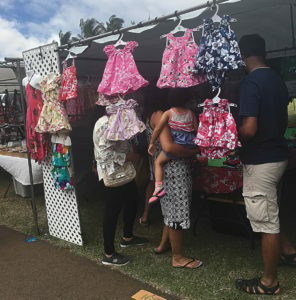 Do you like shopping at the Maui Swap Meet too? Who are your favorite vendors and what do you usually buy from there? Until next time, and maybe I’ll see you at the Maui Swap Meet one of these days. That would be fun!